I rode down line 12, almost to the southern end, and alighted at Zapotitlan. The station symbol shows a tree with three branches containing the sapote fruit. This represents the first part of the station name. 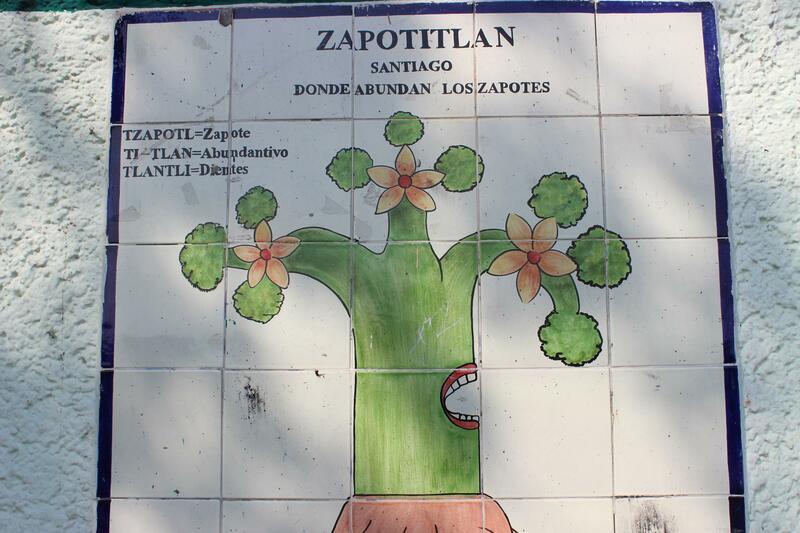 The ‘titlan’ suffix means ‘between’, so Zapotitlan means between the sapote trees. Around the station I found what they call here ‘una colonia popular’, (a lower socio-economic neighbourhood) and a particularly colourful one at that. Early on I met Eric and Hernando, two fairly amiable imbibers, who offered to take me on tour of the area. I opted to fly solo. They did make a subsequent appearance in my visit, however. Santiago Zapotitlan, sits below the Volcano Xaltepec and is a neighbourhood full of street art, predominantly of the religious and historical variety. Street art has long been a highlight of this project and my finger clicked into overdrive with bountiful photo opportunities. Evidently a pious community, the daily battle between good and evil is personified by Satan challenging Jesus in an arm wrestle. A quaint stone church is a focal point. I wandered up and down the streets, crossed over the busy Tlahuac Avenue and entered the local sports centre and saw Bart Simpson’s football skills (on display in art) mimicked by a Mexican boy of a similar age, enthusiastically coached by his father. I witnessed a fronton ball whacked with impressive precision and force and then was called to attention with the inevitable ‘ oye güero !‘ by my old (new) friend Eric who was hanging with an extensive posse of liquor swilling, weed smoking, gambling and good-natured gibing comrades who had sequestered themselves in a quiet corner of the arena. I was coaxed into a cupful of mezcalito, cheap, plastic-bottled firewater, mixed with raspberry jarritos and I was variously mixed up as being from Italy, Austria and Cancun by Eric, the peak inebriate of the crew, who claimed that our eyes were so similar we would pass as brothers. 20 minutes passed in the warm afternoon sun amongst chatter, jokes and laughter. As 2 peso coins continued to change hands in a hotly contested game of cards, I bade my farewell to the cheerful collective and wandered off into the streets again to be greeted by more swirls of colour and ambling or lazing canines. Finally, I returned to the metro station and soon enough a metallic tangerine earthworm delivered me back to the city’s pulsating core. Viajé por la linea 12, casi al fin del sur y bajé en Zapotitlan. El símbolo de la estación muestra un árbol con zapotes en sus tres ramales. Esta representa la primera parte del nombre de la estación. El sufijo ‘titlan’ significa ‘entre’, así que Zapotitlán significa entre los árboles de zapotes. Alrededor de la estación encontré una colonia popular muy colorida. Poco después de llegar conocí a Eric y Hernando, dos embebedores bastante amigables. Me ofrecieron un tur de la colonia. Opté ir solo. Sin embargo, aparecieron nuevamente en mi visita. Santiago Zapotitlán, está al pie del volcán Xaltepec y es una colonia llena de arte callejero, predominantemente de la variedad religiosa y histórica. El arte callejero ha destacado en en este proyecto desde el principio y mi dedo se puso a actividad frenética con oportunidades abundantes de fotografía. Evidentemente una comunidad piadosa, la lucha día a día del bien contra el mal se personifica con Sátan echando un pulso contra Jesus. Una iglesia pintoresca de piedra es un foco de atención. Vagé por las calles, crucé la avenida transitada Tlahuac y entré el centro deportivo. Vi las habilidades de fútbol de Bart Simpson (en arte) imitada por un niño mexicano de semejante edad, entrenado con entusiasmo por su padre. Fui testigo a una pelota de frontón golpeada con precisión y fuerza impresionante. Luego me llamó a atención mi viejo (nuevo) amigo Eric con el inevitable ‘¡Oye güero!‘. Estaba en un rincón tranquilo de la arena con una banda de bebedores de licor, fumadores de mota, bromistas y apostadores. Me convencieron a tomar una copa de mezcalito, mezclado con jarritos de sabor frambuesa y Eric, el más borracho del grupo, confundió mi origen variamente de Italia, Austria y Cancún! También afirmó que nuestros ojos eran tan parecidos que nos podrían considerar hermanos. Pasaron 20 minutos en el sol agradable de la tarde con conversación, chistes y risa. Mientras monedas de 2 pesos continuaban a cambiar manos en un juego de naipes competitivo, despedi el grupo alegre y empecé a vagar una vez más por las calles. Me choqué con más espirales de color y perros andando o reposando. Finalmente, volvi a la estación de metro y dentro de poco un lombriz metálico anaranjado me entregó de vuelta a la corazón palpitante de la ciudad. Good to see you back on the rails amigo! Thanks Gary, it’s good to be back – it’s a labour of love. I’ll finish line 12 and then move on to something else, probably. Every now and again I think to include el tren ligero and el tren suburbano but I think that might be a bridge too far. Wait and see, there is a lot of other stuff of interest here in DF as you sure know. Cheers!